I ordered a Aero M5E1 builders set and 16" Rainier Arms Match .308 Intermediate Lightweight barrel this morning. I already have a BCM carbine receiver extension, Magpul ACS stock, Daniel Defense clamp on gas block and Geissele SSA-E trigger. Will the SSA-E work in the M5E1 lower? I've heard it's not compatible with some 308 AR platforms. Also, what would you guys suggest for the buffer and spring setup? I'd prefer not to buy an adjustable gas block since I already have a standard block laying around so I'd like to hear what's worked best for you guys. Standard mil-spec carbine buffer tube. It'll absolutely work with your Aero, no problem. The fire control group in large ARs has the same dimensions as small ARs and are typically compatible. Their AR15 extension? Or this one? Can you measure the inside depth of it to the 1/16th inch? This will determine what buffer and spring will be appropriate. Not quite 1/32 short of 7"
I wonder if I'll be better off just getting the Aero 308 carbine extension/buffer/spring kit. The buffer is 2.5" and only 3.8oz though, I felt that a heavier buffer would be ideal but I really dont have much experience with the large frame platform. A 7 inch extension should be fine with a 2.5 inch buffer. An H3 buffer at 5.4oz (iirc) is what you need though. @98Z5V may have other recommendations. Also, post a picture of the spring length. That can be a problem sometimes as well. I dont necessarily need to use the BCM extension. I was reading a sticky in the compatibility sub forum and found a link to the Heavy Buffers CAR 10 buffer. Its listed at 5.5oz and 2.620", I assume this would be a compatible buffer? Only problem is it's like $120 (ridiculous) and the suggested modified spring is out of stock. It might not be a bad idea to just buy a kit that's known to work at this point. One that has the extension, buffer and spring. Is there such a thing out there that has the H3 buffer? So after looking around more it sounds like quite a few people have used the ~7" extension paired with a KAK 2.5" 5.3oz buffer and the Sprinco Extra Power orange spring with success. I'm getting the feeling this is going to be a trail and error thing considering I have no idea yet if the Rainier Arms intermediate gas port is properly sized, overgassed or undergassed. I just hate to spend $90 on the buffer and spring to find out it wont work. I know I'm jumping in the middle of this but you're trying to put to much thought into this receiver extension tube and buffer and buffer spring thing. The companies that have been doing this longer had already worked out the math and figured out what combinations worked and what didn't. Now with all this information it can get real confusing and if you keep over thinking this, your head is going to explode. 1. You need a spring for the .308/7.62 round, it is a stout spring and usually around 14" long to 13-1/2" long. 2. The buffer will have to be slightly shorter (about 3") but much heavier than one used in a .223/5.56 carbine as a minimum at least 5.2 oz.to 5.5 oz. You said a 3" buffer & 5.2-5.5oz, would I be wrong to use the KAK 2.5"/5.3oz buffer being 1/2" shorter? The shorter buffer is good in that shorter tube and the weight is in a good range also. Great, I'll start with that and go from there. Last time I ordered an upper from Aero it took a couple weeks so I'm sure the receiver set will take as long, if not longer so I have some time. What BCG would you guys suggest? Besides the scope, the BCG and Warcomp are all that's left to order now. The Brownells BCG is on sale for $129 right now but has some questionable reviews. Thank you, I'll order one today. Has anyone used the Armaspec Stealth Recoil Spring 308 (JP SCS copy)? I believe it's a 5.7oz buffer and dual spring system. Its about the same price as the KAK Shorty buffer and orange Sprinco cost but it says up to 15 days until it ships. Now everything is ordered, just waiting on the Surefire Eliminator 3 prong, Armaspec SRS buffer system and the Aero M5 builders kit. Aero sent me a tracking number on Friday the 8th and it's been in limbo ever since just saying "shipment information sent to FedEx". I called Aero today to find out what the heck is going on and the lady politely told me they shipped the order on the 8th. I explained that my FFL hasn't gotten anything and the tracking shows it wasnt actually shipped, just a label was created. After a 15 minute hold she basically said the package either isnt getting scanned and it's in transit, or its lost and I'll have to file a claim. What a crock! I've had amazing CS experiences with Aero in the past but I'm not going to be happy if I have to file this claim myself and wait who knows how long to get the parts I just paid almost $550 for. She said she will call me back tomorrow hopefully. I borrowed a set of Clymer 308 Match headspace guages 1.630 GO & 1.634 NO GO. Stripped the bolt and the NO GO doesn't chamber, great. Try the GO guage and it also doesnt chamber but the bolt does turn a bit, just not enough to lock. I painted two different factory 308 rounds with a sharpie. First was Hornady Black 168gr Amax and the other was Norma Match 168gr SMK. Both chamber just fine but extraction is a tad sticky with the Hornady (no mortaring or anything). The bullets look to be touching the lands just the slightest bit, it removed the sharpie lightly but there isnt anything I can feel with my fingernail on the bullet. I chambered these rounds with the mag inserted and letting the BCG slam home. This is a Rainier Arms Match barrel and Toolcraft 308 Nitride BCG. 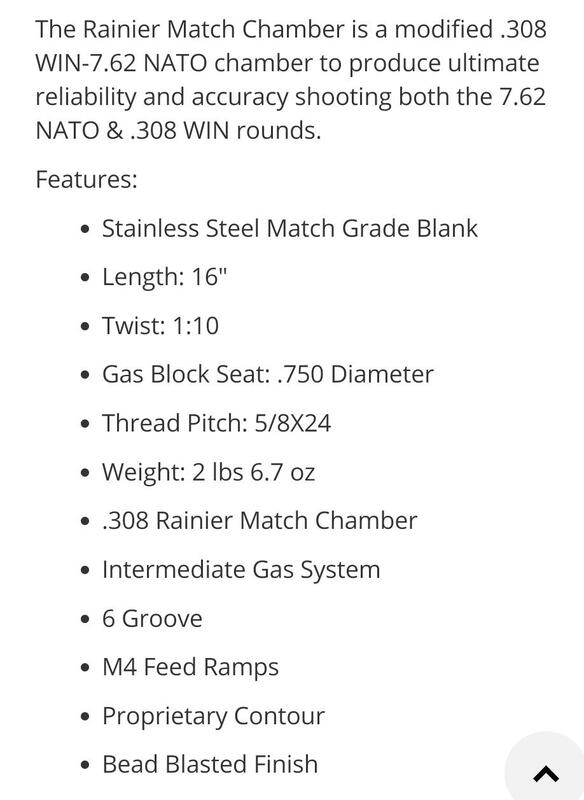 Apparently Rainier has a modified 308 chamber. Would I be pushing my luck if I went ahead and fired this gun? I've recently talked to a member on ARFCOM that is experiencing nearly the exact same thing i am with his new 308 build using a Rainier barrel. What is the barrel specifically chambered as... .308 or 7.62? The ammo that you marked and chambered with, are they... .308 or 7.62? It's a Rainier Arms Match barrel and it has a modified 308 chamber proprietary to Rainier. 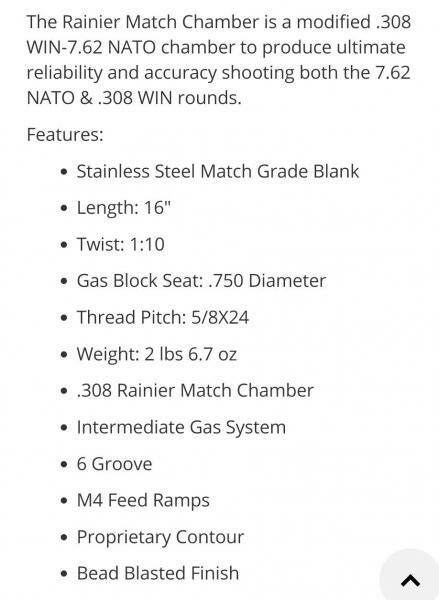 From my understanding its similar to 223 Wylde, it's not 308 or 762 NATO but is supposed to shoot either. This is my thread regarding the headspace of my 308 on ARFCOM if anyone cares to check it out.